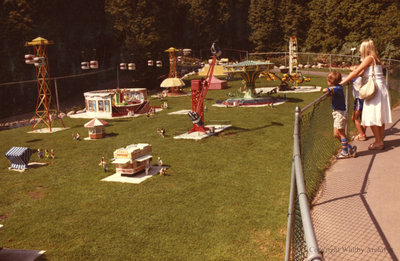 A colour photograph of the Miniature Country Fair at Cullen Gardens and Miniature Village. In this view two children and a woman are standing at a chain link fence looking at the fair. The models of the rides are 1/12 scale and are replicas of rides found in real country fairs in Southern Ontario. Miniature Country Fair, Date Unknown, Photographer Unknown. Whitby Archives A2013_042_250.